INDUSTRY.co.id - Jakarta - Sea waves with a height of six meters still threaten a number of waters in the territory of Indonesia until Thursday (26/07/2018). 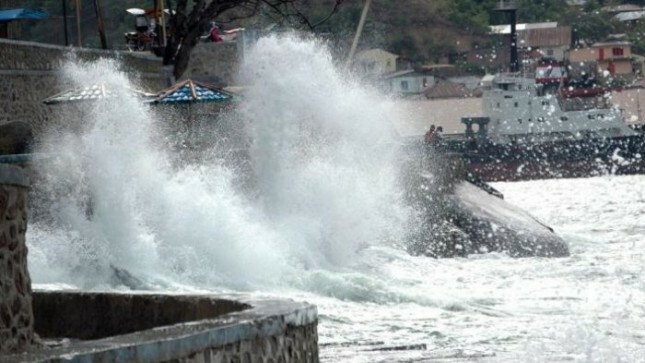 Information from the Head of Public Relations of the Meteorology, Climatology and Geophysics Agency (BMKG) Hary Tjatmiko in Jakarta, Wednesday, said the wave heights of four to six meters still occur in a number of waters. He specifies the height of 4-6 meters of waves is likely to occur in the Northern Waters of Sabang, North Aceh Waters, West Waters Simeulue Island, West Waters of the Nias Islands to the Mentawai Islands. Also likely to occur in Enggano-Bengkulu Waters, West Lampung Waters, Southern Sunda Strait, West Indian Ocean Sumatra, South Banten Waters, South Java Waters, South Bali Island and Sumbawa Island. As well as in Bali Strait to Lombok Strait and South Alas Strait, Western Sumba Strait, South Waters of Sumba Island, South Indian Ocean Java to NTT. While sea waves with an altitude of 2.5 meters to four meters are also likely to occur in the waters of West Aceh, the northern Sunda Strait, the waters of South Flores, the Savu Sea, the southern waters of Sawu Island to Rote Island. While the sea waves with medium height or reaching 1.25 meters to 2.5 meters are likely to occur in the North Malacca Strait, East Waters of Simeulue Island to Mentawai Islands, South Kupang Waters, Ombai Strait, South East Timor Sea, Sermata Islands to Islands Tanimbar, the Southern waters of the Kei Islands to the Aru Islands. As well as in the Arafuru Sea, Karimata Strait, Java Sea, South Kalimantan Waters, Southern Makassar Strait, North Lombok Sagian Strait, East Waters of Wakatobi Islands, Manui Waters to Kendari and the Eastern Flores Sea. Then, the Banda Sea, the southern waters of the Banggai Islands to the Sula Islands, the waters of the Sangihe Islands to the Talaud Islands, the northern Maluku Sea, the waters of North Halmahera and the North Pacific Ocean Halmahera. BMKG predicts an extreme wave peak occurs on July 24-25 and a high wave of up to four meters is still likely to occur until July 28, 2018 due to enter the peak of the dry season in July-August.